Avon Shire (1865-1994), an area of 2533 sq km, lay between Sale and Bairnsdale, Gippsland. It extended northwards from Lake Wellington to the Victorian alps, sharing a boundary with Bright Shire. From north to south the shire measured 95 km. It was named after the Avon River, which was named by the explorer Angus McMillan in 1840. In the early 1840s the southern part of the shire was occupied by the Stratford and Strathfieldsaye pastoral runs (1842) held by William Raymond, the Clydebank run held by Lachlan Macalister (1843) and Bushy Park held by McMillan (1840). The first town settlement was Stratford, which was stimulated by cattle trade out of Gippsland and as a transport point for supplies to the Grant (Crooked River) goldfield north of Stratford. The Avon road district board was proclaimed in 1864 and within a year was designated as Avon Shire. On 14 October 1875 Maffra Shire was excised from Avon Shire. About one third of the shire had good agricultural land for grazing and cropping, and in the 1950s some farms were irrigated. The northern two thirds of the shire rose to hills and mountains, part of which have been designated the Avon wilderness area. Dargo, in a mining and grazing area, was the sole town in the north. 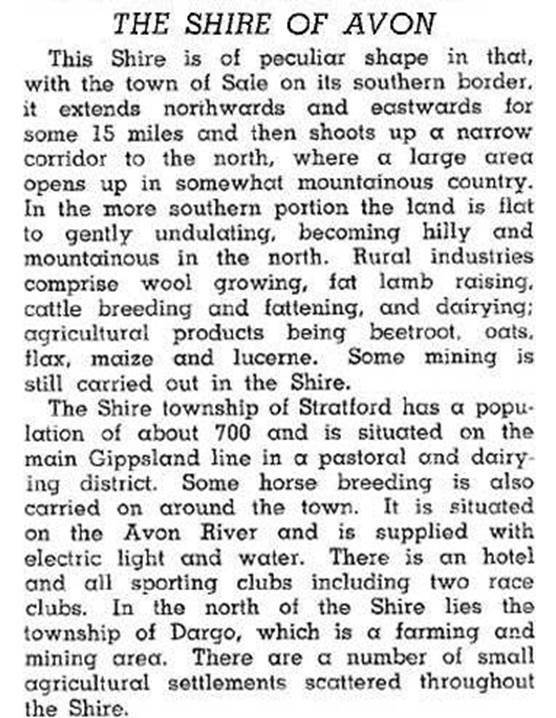 The Strathfieldsaye pastoral run between Stratford and Lake Wellington was reduced from 62,000 to about 20,000 acres by 1869. About 2300 acres were also excised for the Ramahyuck Aboriginal mission (1863-1908). The land ranged from grassy plains to lakeside morass, but much of it was suitable for grazing. Rural villages such as Clydebank and Meerlieu emerged, and there were dairy/cheese factories at Stratford and Clydebank. The Gippsland railway reached Stratford in 1885. Irrigation brought mixed results. The upstream Macalister irrigation district was a success, but around Cobains near Lake Wellington poor drainage caused land salinity. Overall, however, postwar prosperity brought amenities such as an infant welfare centre, a swimming pool and a flood-proof bridge to Stratford. The 1970s saw restrictions on high plains cattle grazing and an Alpine National Park was proclaimed over part of the far north of the shire. In the south the remarkably intact Strathfieldsaye homestead and farm buildings were heritage listed. In 1994 Avon Shire had 64% of its area used for farming. Sown pasture was 18%. There were 188,000 sheep and lambs, 31,400 meat cattle and 15,650 dairy cattle.